Definition at line 21 of file service.c. Referenced by ServiceCtrlHandler(), ServiceMain(), and UpdateSCMStatus(). Definition at line 84 of file service.c. Definition at line 102 of file service.c. Definition at line 123 of file service.c. Definition at line 109 of file service.c. Definition at line 42 of file service.c. Referenced by ServiceMain(), and UpdateSCMStatus(). 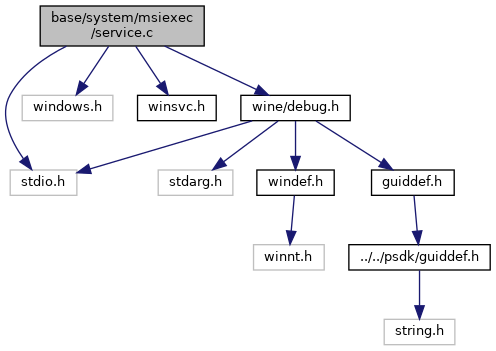 Referenced by KillService(), ServiceExecutionThread(), and ServiceMain(). Referenced by _beginthread(), _Function_class_(), cache_connection(), child_process(), custom_get_thread_return(), do_read(), do_wait_idle_child(), end_host_object(), file_layout_read_thread(), file_layout_write_thread(), FinishNotificationThread(), http_release_netconn(), IMM_GetThreadData(), IMM_IsCrossThreadAccess(), iskeyword(), LS_ThreadProc(), main(), mds_commit(), Netbios(), netconn_resolve(), PdhCloseQuery(), PdhCollectQueryDataEx(), PrintStackBacktrace(), PrintThread(), request_destroy(), request_wait(), rpcrt4_ncacn_http_open(), RPCRT4_new_client(), RtlDeleteTimerQueueEx(), run_thread(), ServiceMain(), SHCreateFromDesktop(), start_host_object(), start_host_object2(), start_installation(), START_TEST(), StartNotificationThread(), StartServiceThread(), sys_thread_new(), test_activateapp(), test_alertable_wait(), test_apc_deadlock(), test_bsc_marshaling(), test_call_from_message(), test_channel_hook(), test_client_security(), test_CoFreeUnusedLibraries(), test_CoRegisterPSClsid(), test_CoWaitForMultipleHandles(), test_CoWaitForMultipleHandles_thread(), test_crash_couninitialize(), test_CreateThread_basic(), test_CreateThread_stack(), test_CreateThread_suspended(), test_dde_default_app(), test_default_ime_window_creation(), test_defwinproc(), test_ExitProcess(), test_external_connection(), test_FindFirstChangeNotification(), test_GetDataHere_Proxy(), test_GetKeyState(), test_gettext(), test_GetThreadExitCode(), test_GetThreadTimes(), test_globalinterfacetable(), test_handler_marshaling(), test_ImmDefaultHwnd(), test_implicit_mta(), test_Input_mouse(), test_InSendMessage(), test_interthread_marshal_and_unmarshal(), test_keyed_events(), test_layered_window(), test_marshal_and_unmarshal_invalid(), test_marshal_channel_buffer(), test_marshal_proxy_apartment_shutdown(), test_marshal_proxy_mta_apartment_shutdown(), test_marshal_stub_apartment_shutdown(), test_message_filter(), test_MessageBox(), test_messages(), test_multithreaded_clipboard(), test_mutant(), test_no_couninitialize_client(), test_no_couninitialize_server(), test_proxy_interfaces(), test_proxy_marshal_and_unmarshal(), test_proxy_marshal_and_unmarshal2(), test_proxy_marshal_and_unmarshal_strong(), test_proxy_marshal_and_unmarshal_weak(), test_proxy_used_in_wrong_thread(), test_reader_info(), test_registered_object_thread_affinity(), test_render_with_multithread(), test_RtlIsCriticalSectionLocked(), test_RtlRegisterWait(), test_runner(), test_SendMessageTimeout(), test_set_clipboard_DRAWCLIPBOARD(), test_SetCursor(), test_SetForegroundWindow(), test_ShowCursor(), test_SuspendThread(), test_tablestrong_marshal_and_unmarshal_twice(), test_tableweak_and_normal_marshal_and_releasedata(), test_tableweak_and_normal_marshal_and_unmarshal(), test_tableweak_marshal_and_unmarshal_twice(), test_tableweak_marshal_releasedata1(), test_tableweak_marshal_releasedata2(), test_TerminateProcess(), test_TerminateThread(), test_thread_actctx(), test_thread_info(), test_thread_security(), test_thread_start_address(), test_Toolhelp(), test_two_tableweak_marshal_and_releasedata(), test_typelibmarshal(), test_WaitForInputIdle(), thread_data_server(), thread_init(), thread_next_unit(), threadFunc3(), wait_for_thread(), wave_out_test_deviceOut(), window_proc(), and write_file().